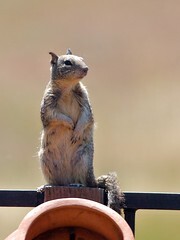 California Ground Squirrel, originally uploaded by Here Be Dragons. In an attempt to up my "cute quotient" after posting the Jerusalem cricket photos this morning, I make this offering: California ground squirrel. This one is still sitting up on my back fence as I write this, in fact, looking as cute as ever. 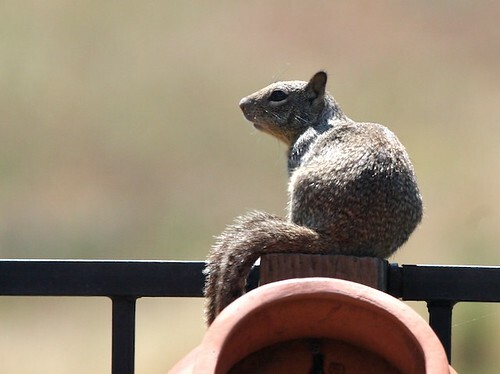 A few minutes ago, s/he was making a chirping noise that I would have attributed to a California towhee (a type of large sparrow) if I hadn't seen the squirrel actually making the sound. And now for something completely different . . . C and I are off to the movies, to see "Iron Man" again. :) (Assuming the theater can get the film to play today). LOL! It's like Marvel Rodenthero day around here! First, Wolverine Squirrel, and now Iron Squirrel! W00t! Okay. That's it. I totally need a Marvel icon. Soon. Too lazy to go hunting for one just this minute. :D Heh. 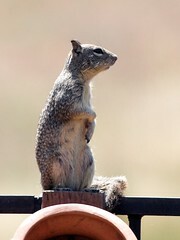 If I get really adventuresome, I might photoshop some armor onto the squirrel photo, and make my own brand new superhero. Except that would be extremely dorky. (Like that's ever stopped me before).